Blessed beings, as always, it is a precious moment when we meet in your awareness, for it is your awareness that shapes life. Your awareness is the powerful catalyst that continues life’s progression. It is an immense power. It is a quiet power. It is a passive power. We speak of the active force and the passive force in relation to your experience here so that you will begin to recognize the immense power that is within you and understand its workings. This helps you balance the physical expression and non-physical expression that you are. 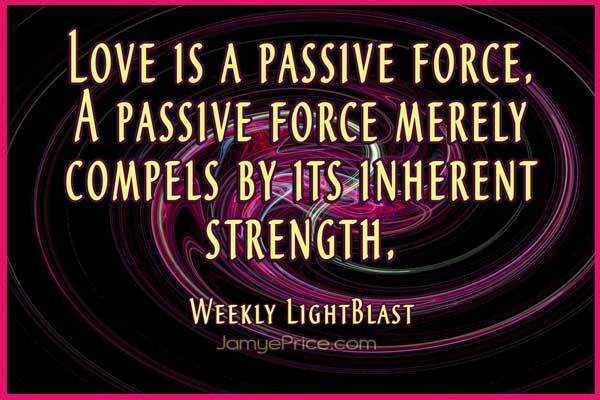 Your passive force is a non-physical force. It is a subtle force. It is the force that creates a compelling of life to it. The active force consumes, the passive force compels. In physical form, you utilize both of these and this is important. What you are learning now is to adjust the usage of your non-physical form and utilize that great momentum, the passive force, that is within you. These are the rules of the subtle realm. We have used the reference of the atomic structure in a very basic form so that you recognize the basic building ratio of 99% space and 1% matter. This same ratio is throughout all aspects of physical form. You have 99% non-physical you, and 1% physical matter. You reside in a world of 1% physical matter and 99% non-physical. Your thoughts and your feelings, your subtle bridge, are your communication with non-physicality, so as you think and as you feel, you compel. That is your passive force. But the passive force and the active force must meet in the physical realm, so they are always interacting. Where the two meet is where new creation begins. It is your choice point. Where the passive and the active forces meet is your choice point. The passive force is like that minute energy within an atom that, when utilized, becomes an enormous force. That same power is within you. As you utilize the passive force, which from the physical realm seems minute, it becomes an enormous force because you are utilizing the momentum of that huge 99% engine that creates worlds. That is within you. Your awareness is that catalyst where the passive and the active forces meet. Now, we want to review some of how we have been speaking about Time because this information is designed to help you understand your awareness more clearly. We have said that Time is a relationship. As you experience it, you see its effect. This is what we would call the active force of Time, the effect that it has here in the physical realm, the 1%. You see the passage of days, nights, weeks, seasons, cycles. You experience it linearly here in physical form, and that is the active expression of Time, but Time is a subtle experience as well. Time has a relationship with you because as you actualize your understanding of your feelings and thoughts with Time, you begin to interact on a subtle level with a powerful quantum engine. You adjust your relationship with Time. As with all subtle energies, they work with a compelling, or a resonance, which attracts and combines. As you work in the physical realm, it is your active choice of action that consumes and creates anew. The difference then, as you relate to Time, is to shift your resonance, your relationship within, and Time will respond to you differently. As you open your energetic flow, you are allowing Time to flow more smoothly within and through you. As Time flows more smoothly through you, your manifestations seem to come faster. They do—but you can not do it for the speed of it. That is active force. You can not manipulate resonance, you must be resonance. All physical matter contains a relationship to Time within it. Within every cell, within every chemical bond—there is a relationship to Time within that structure. Time’s flow is within the matter. Think of this as you would imagine sound waves that could travel through a wall, and if you were on one side of the wall, the sound would be clear and obvious. It would pass through the wall, affecting that structure and be audible on the other side. Perhaps not as clearly, but physically audible. Just as all of that structure has sound flowing through it, Time has a similar functionality. It’s flow is in-built into all matter. All matter interacts with it. All structure interacts with It. Ultimately, Time is movement from this perspective. It’s movement is the spiral. The passive force of Time is calling for you to allow that flow through your structure more readily. Rather than resisting it, allow Time to flow through easily. This relationship with Time is your peace, your openness, your knowing that all is well and occurring perfectly, and that all that you need, you will access in that moment. You are prepared and you are open—you are peaceful—Time then flows through your structure more easily. Instead of just reacting to what is occurring, you are flowing and allowing this natural law to propel you and compel you through your choice. Rather than mere reaction, you are utilizing an open awareness and responding. This relationship with Time is offering you more ability for the natural laws of the universe to interact with your mastery. You are utilizing your vibrational resonance, and consciously choosing to utilize the 99% non-physical of you. We used a visualization recently to discuss Time as the hourglass of a spiral, a spiral that is wide at the top and gets smaller towards the center and then spins in the other direction and gets wide at the bottom. We use this visualization because it actually represents the physical structure of Time, though it is invisible, because Time moves in relation to its environment and all energy here spins. Time is in-built into all physical matter so it represents the same structure of movement. The spiral, while you can use the metaphor in many ways, represents an aspect of “physical” Time. It is a toroidal shape expanded and stretched. As you imagine that hourglass spiral that is spinning slowly and wide at the top and then getting smaller and faster as it meets the middle, that point in the middle is where you could imagine the metaphor of the passive and active forces meeting. The spiral then shifts direction. Imagine this spiral—with this active and passive force meeting at the core of that spiral—this is what your awareness does. Allow that flow to occur and allow the natural momentum of life to work with you and through you. This is the core of your power, that as you allow that spiral of Time to flow its ease within you, you create a powerful reaction that shifts the physical structure here on Earth. It just takes Time. When you can observe Life from the possibilities and enjoy the interplay of what you are desiring, and then the synchronistic information that flows to you—it becomes more exciting. When you allow those synchronicities to show you that you are creating a difference, you are tapping into information and knowledge that is natural to you—it makes it more exciting. Then accessing patience becomes easier, and it becomes a much smoother ride. This spiral is the core of peace that smooths your flow with Time. There are still some exciting ups and downs, yes, but a much smoother ride because you are allowing the ups and the downs to flow with you because you know the outcome—creation. The spiral continues. So as you observe your interaction with Time, you can utilize that imagery of the hourglass spiral and observe how things move along that spiral and reach a culmination point. Now imagine that it is you on that spiral. What would that ride be like? It would be a little calmer at certain points, it would begin to get faster and faster and faster, and what occurs as you are spinning faster? Physically, you start to feel a push-pull, a pressure. Are there any instances that you can see a push-pull going on in your world? Yes, that spiral is spinning faster and reaching a culmination point of change. If you were in that spiral and spinning faster, what would be your best choice to deal with that push-pull? Physically with your body, as you resist that push-pull, it becomes very difficult. When you relax into it, that spin carries you. As that spin gets tighter and tighter, your body folds in on itself in this physical metaphor. As the spiral spins faster and faster, that is the Time to go inward. That is a Time to utilize that powerful catalyst within you and allow that quiet, passive point within you to release that nuclear power of awareness and choice. You go inward and that new clear reaction happens within you because you are observing the possibilities. You are observing the potential that humanity is spinning ever faster into. You are utilizing that powerful force within you to focus inward on your desires and let that catalyst of your passive, 99% engine of Life, react with this environment. That is the power of love, that is immense within you. It is the passive force, and this passive force is a powerful force. It is the force that is so powerful that it does not need to dominate to understand its power; it merely compels; and it builds worlds. When that spiral is spinning fast, it creates a new world, a new clear world. That is the power of your consciousness and it is occurring continuously. As you utilize that awareness, you allow your choice to flow more strongly into this world. As you focus your powerful passive force with your peaceful purpose, you are amplifying the power of your awareness. You are not seeking to control out of fear, that is an active force applied into the subtle realm. It creates, but with a chaos that seeks its structural resolution. Love is the creational current of the cosmos. Seek your internal peace, and you will be expanding your spiral of influence—for the open, aware and Knowing state of peace is powerful. As always, it is an honor to meet in your awareness. Eeshah, Ehmah, Ehtah. We receive you, we Love you, we carry your Love forward as Life is changed by your interaction.